This was absolutely wonderful and wonderfully diverse, why did it take me so long to pick it up? 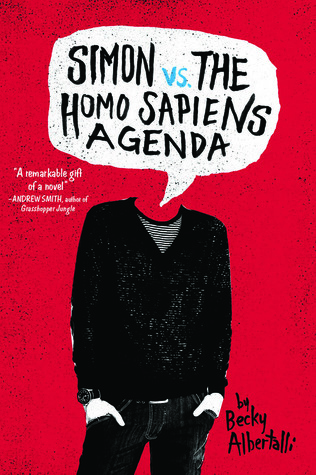 It's a real coming of age story, about Simon, who's gay and trying to figure out how to tell his family and friends, and who to be apart from that. It's a book about self-discovery and self-love. About being brave enough to be or become who you are and challenging the default. It challenges the coming out narrative, which is done nuanced and well, and is what the title is referencing to. It's queer positive, full of epic friendships and awesome characters (Abby, in particular, is absolutely great). It has a super cute high school romance, Harry Potter references and endless talk about Oreos. I loved that it was realistic and doesn't hesitate to portray homophobia in high schools, awkward conversations with parents, sexual desires, jealousy and struggles in friendship. It isn't always easy to figure out who you are and what your voice is, but it can be a wonderful discovery. In the end, this is an uplifting story about friendship, family, growing up, and a super sweet romance. The perfect, light summer read, guaranteed to make you happy.